You probably can't imagine how much I hate to call this one a 'Palm'. It's as much of a palm as I'm a hedgehog. But it's the common English name and in German, too, it's called a palm sometimes. But if one wants to sort it into a category somehow, rather call it a lily. 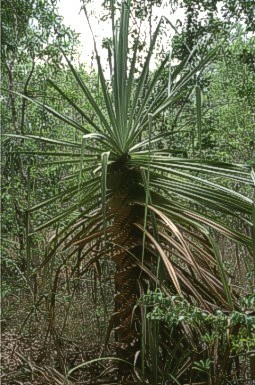 In fact, the Pandanus genus is well used by the locals, where ever it grows. And on several places like islands there is anyway not much more growing than just these hard shrubs. So people use fruits for food and medicine, the leaves for weaving and the oil of certain species for perfume. In fact all Pandanus species have this screw pattern of producing leaves, it's only not always clearly visible. This one here was cut, as it lives next a track in Territory Wildlife Park and the long hard leaves with their saw-like edges may hurt the visitors.